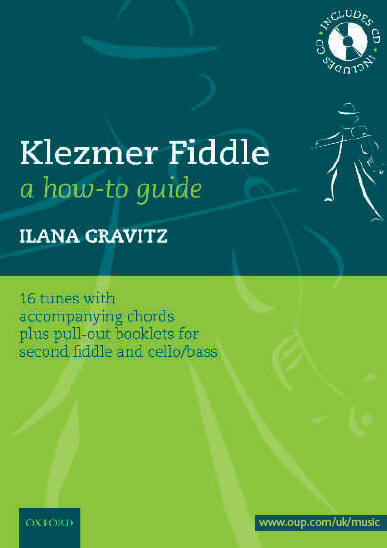 Buy Ilana's new Klezmer tutor - suitable for anyone wanting new tunes, play-along parts, or ways to explore traditional-style playing. 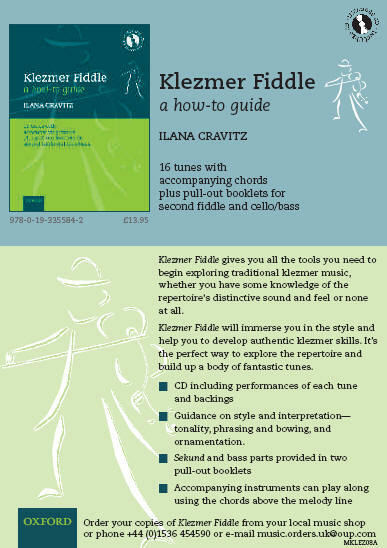 Klezmer Fiddle - a how-to guide is a new tutor book, published by Oxford University Press and available at a special price via this website only. The book contains 16 tunes in treble clef with chords above the stave for easy accompaniment. Currently in use by clarinet players, oboists, cellists, as well as viola and bass players, the melodies, accompaniments, and tips on playing have appeal and application well beyond violinists! Each tune has a ‘workshop’ on playing in traditional style. There’s also a CD with the complete set of tunes, historical recordings of a selection of the melodies, plus backing tracks you can play along to. The package contains two pull-out booklets with bandstand-style parts for sekund and bass players. Order the book from OUP in one of the following ways, quoting the book's ISBN, which is 978-0-19-335584-2. The price is £13.95. The book is available from local music stores and can be purchased online from Amazon. The list price on both Amazon and at OUP is $21.95.